Nexys-2 1200 is a Xilinx FPGA board made by Digilent. It has a large FPGA, the 1200 version is the ‘upgrade’ from the basic size of 500; the 500 version can maybe run some of the smaller PDP11 models, but certainly not the bigger ones. So I’d definitely recommend getting the bigger chip if you’re still going to order a board, it is not that much more expensive, but it will give you a much larger chip to play with. Nexys-2 has 4 of the newer 12-pin PMOD connectors, and you can get 4 more 12-pin and two 6-pin connectors if you plug in the FX2MIB extension board. That’s a lot of room to connect peripherals to – and you’ll need at least one PMOD to plug in an SD card connector, as there is no card connector on the board itself. There is already an RS232 plug on the board, but it’s easy to plug in a couple of PMODs too, so you can run a PDP11 with more than just one console. It’s good fun to see several programs run simultaneously – especially with ancient stuff like MU-Basic, it is impressive to see how well it works. 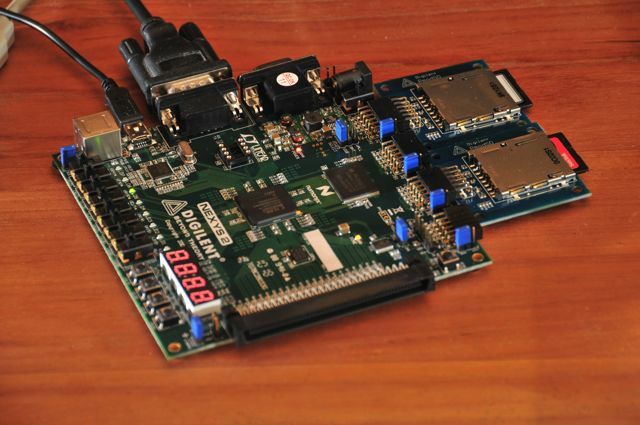 The memory on the board is PSDRAM, which you can use both as static RAM as well as SDRAM. The current top level memory controller for the board drives the PSDRAM as static ram. Maybe the clock speed can be increased a little if it is driven using the SDRAM timing model, I have not really thought this out yet.